Compressor manufacturers demand a <5% residual mineral oil content when converting over to 134a. If not, the remaining mineral oil will not mix well with the synthetic oil and a sludgy mixture will take place. The sludge will then lodge itself everywhere causing havoc with your system pressures. Andy (any any others reading this I suppose) Is there any way to tell if 134a has been put into a car that wasn't fitted for it? If it has been, will this "sludge" you talk about form, or is that something that only happens if the system hasn't been completely vacuumed and refilled with oil? My car's been off the road for almost 10 years and of course the A/C doesn't work. 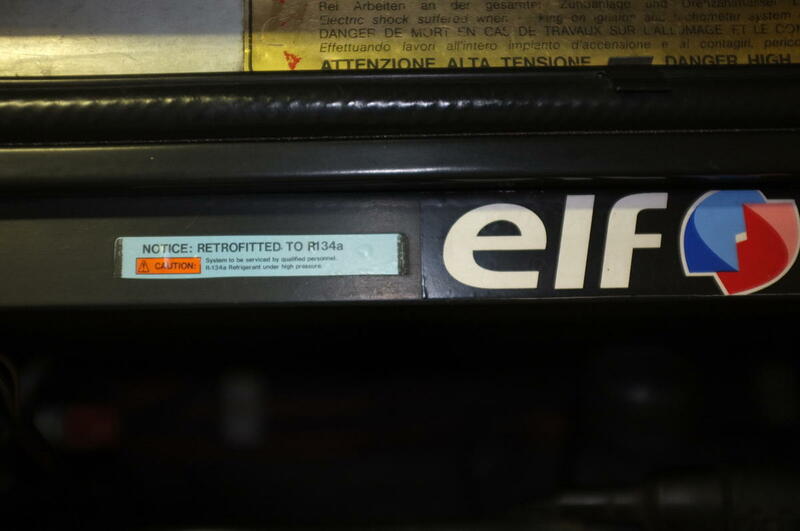 I'm bidding on some R-12 to re-charge with, but I have a vague memory of taking in to a shop years ago and having them re-fill the system, this was *after* R-12 got pissed on by the EPA. I'm wondering if there's any way to find out if they did something like fill it with 134a using one of those parts store adapter kits. When a vehicle is charged with R134a (legally; meaning R134a service port adapters have been placed over the R12 service ports), the service port fittings (where the refrigerant service hose set is attached to either evacuate, charge or test) will look something like the picture below. 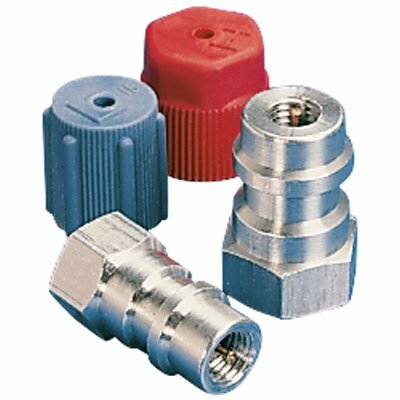 The metal fittings can be either aluminum or yellow/zinc steel, there is a schrader valve inside and the inner port inside has a thread. There can be colored caps, alike the Red (high side; larger diameter) or Blue (low side; smaller diameter). Further below is a typical R12 service port. It also has a schrader valve inside, however it has a thread on the outer diameter. 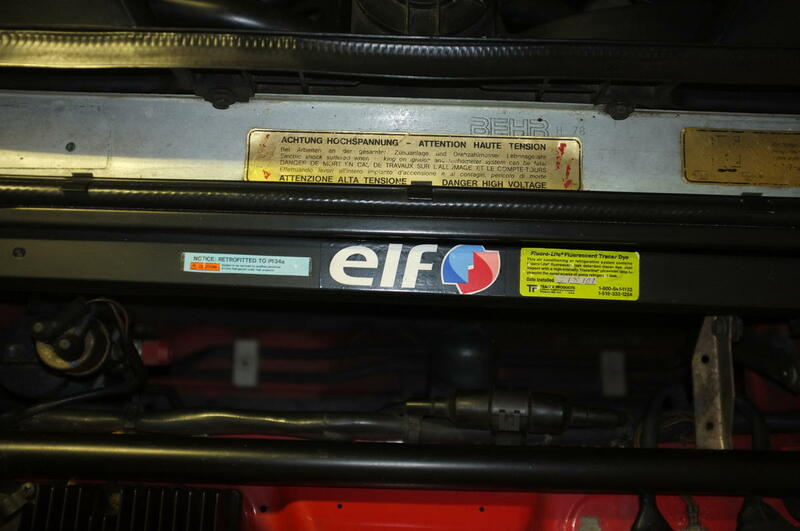 If they really did the job correctly (legally), there would be a Blue Label or Sticker somewhere in the engine compartment, alike the pic further below, which advises whomever is working on the AC system that the car was converted to R134a, amount of refrigerant, type of oil, etc. It's good to know what kind of refrigerant oil was used in the conversion (Esther or PAG). Other sources to review to determine if the vehicle was converted would be past repair records (its a bonus to find, and even better when they document the amount and kind of refrigerant, pressures, type of oil, etc; if you have AC work done by a repair shop, ask them to document these things in the work order or on the invoice). Is there any way to tell if 134a has been put into a car that wasn't fitted for it? ...I'm wondering if there's any way to find out if they did something like fill it with 134a using one of those parts store adapter kits. I'm wondering the same as Scott for my car. When I bought my car, the PO told me that he had the system fixed after some problems. He told me that the shop put back some R12 in the system. They did not make the conversion to 134. As my AC is on the cool side, not cold anymore, I want to top up the system with R12 (I have two cans). But before putting some R12, I want to be 100% sure there is no 134 in there. The car has all the R12 fittings. Is it possible that they charged the system with some 134 using the R12 fittings? Also, the R12 sticker is not there anymore. But no 134 sticker either. You can buy refrigerant analyzers that will tell you if there is R12 or R134 or something else in the system. They were quite expensive back in the day but I suspect that you can buy them used on ebay for not a lot. Failing that, it's a best guess deal. As I have a jug of R12, I just pulled a vacuum for a couple of hours and then charged with R12. System blows nice and cold now that I have the heater valve sorted. A) Attach a hose adapter to your service gauge hose set. These 'things' are available but you won't find them in the common auto parts "retail" brick and mortar stores. The retail DIY R134a refrigerant kits, legally, must have R134a type service port adapters that screw onto the vehicle's R12 service ports. The less expensive kits have R134a service port adapters that have a pin inside that presses down on the original R12 service port's schrader valve. The better kits have R134a service port adapters which have their own schrader valve so you have to remove the original R12 service port's schrader valve. B) Attach the R134a service port adapter to the R12 service port, and then remove it after you are done. Why would some go through all that trouble? Logically they would leave the R134a service port adapter on the vehicle's service ports because they have a gut feeling they are going to be revisiting it again! 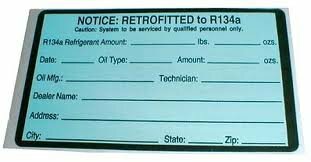 Other than having a tech, whom has a refrigerant identification device (expensive), check the system, you have no way of knowing what is in there (R12, R134a, or other type refrigerants) unless there are identifiable "service port type", a refrigerant identification sticker, or past repair/work orders or invoices. The smartest/easiest/shortest route is to simply recover any remaining refrigerant, if there is any in there, and start from scratch. A) In case you forgot what you did. B) In case a repair shop needs to work on the car they know what they have to work with. C) So the next car owner knows. Outstanding, detailed technical advice as usual for this list. Since the work was done by a small backyard mechanic in an out of the way burg in northern Wyoming, I can't really depend on labels and since t sounds like there *are* adapters available that might not remain on the vehicle, I'm going to take the safe route griffiths suggests and vacuum flush the system before I refill with R-12. I'm going to take the safe route griffiths suggests and vacuum flush the system before I refill with R-12. If you 'think' about it. These vehicles are anywhere from 18-35 years old. Refrigerant oil, debris, etc. Plenty of time for 'oil' to congeal, for rubber to break down. If you consider what the cost of these cars would be in today's dollars. What you are getting for your money. It is worth the extra effort. to "flush" the system (with refrigerant) prior to recharging; years ago it was common to simply use refrigerant as the flushing medium (too costly today and you'd need to recover as you flush). So, when in doubt... do it right the first time.! Thank you very mutch Griffiths. The last notation on this thread was last fall from Mr. Daoust. Now that winter is over with (I hope) the thought of summer AC becomes somewhat interesting. I'm at 7000 - 8300 feet of elevation here in Wyoming so AC is really not a pressing issue. Usually we are more interested in staying warm rather than cooling down. However, my AC has not worked in over 16 years but I'm starting to get the itch to bring it back on line. As I recall, the last time I did anything with it was to recharge the system with R12 but it would not come on cold at all. My last ignorant thought was to convert to R-134A but, after reading the warnings about what was entailed, I think I will stay with the R12. Besides, in my technical readings I am somewhat convinced that, like anything out of the EPA, their technical wizardry is a pile of excrement. I suspect I will go to a local AC shop and I am just wondering what to watch for. Multi thousands of dollars are not in the offing. The idea is to empty out the compressor and then reinstall WITH the required oil in it? You just poor it in? And then vacuum down the system and then let in R12 or whatever? There are plenty of threads arguing the merits of the conversion. The most prominent is the availability of R-134a, at least for now. I think I bought a 30# cylinder at Sam's Club last summer for about $75. Or I can buy 14oz cans for $12 plus a $10 'deposit' here in California. If you have time on your hands and some easy resources nearby, the conversion process eats up at least a day. All the o-rings in the system are replaced. The rubber hose sections get replaced with new barrier hose. You get to drop the AC compressor and drain all the old oil out, flush it a few times, then get fresh polyolester oil back in it before putting it back in. The 'resources nearby' list includes a local AC shop that can rebuild your hoses. You'll need to put a new receiver-drier in, and you'll need to have the system evacuated to get all the air and moisture out before charging it with R-134a. You'll need to figure out what kept the system from working before, and remedy whatever that was. A quite popular failure is the little compressor relay in the control head in the dash. There are several write-ups on that. Search for Dwayne's Garage and his treatise on AC relay fix, and you'll get great guidance. There are other possible electrical things to chase down too. Sadly, most AC shops either won't touch the 928, or will charge a price that's guaranteed to make them money even if they have to replace the whole system. If you can do the bulk of the labor yourself, you can usually limit your exposure to incompetence too. The o-rings are common sizes, and the replacement drier has a 944 part number so isn't totally out of reach financially for most. Replacing the hose sections is subject to local customs on cost it seems. The oil and the refrigerant are commodity items. Getting it evacuated and charged shouldn't be an issue at all if you have a good working relationship with a local shop. This is the part they will gladly do, generally. You should see something like this when the R12 to R134a conversion is done legally. This is a Griffiths conversion done in 2001. Still blows cold. Without getting political I'll agree briefly concerning excrement. Getting it evacuated and charged shouldn't be an issue at all if you have a good working relationship with a local shop. This is the part they will gladly do, generally. My experience also. I used a fellow in Santa Cruz, Rick of R&D Motorsports, to evacuate the system. He was very helpful and identified the compressor seal failure I'm correcting now. PS: You'll also need an EPA 609 certification to purchase and use R12. It costs $20 and is well worth it. For example, you'll learn to differentiate between red and blue gas fittings and you may learn something about ozone! You'll experience a broader understanding of CFCs and how they were supposed to effect the Earth's ozone layer (but unfortunately didn't). It's a wealth of information you'll find absolutely irreplaceable the next time you engage your neighbors in a friendly game of Trivial Pursuits. See: "Magnetosphere" as it applies to the planet Earth. Ozone tends to not form at the South Pole of our planet for reasons that involve the polarity of the core charge of Earth, which acts as a "repellant" to the highly charged particles often referred to as "solar wind" that are necessary in the formation of the O3 molecule. Last edited by Pfc. Parts; 05-09-2014 at 12:11 AM. If possible, stick with R12. You can buy it for $25/can all day and all night. Last visit to ORielly showed cans of R134 at $18/can which is not much of a difference. My 928S will turn your fingers blue with R12 in it. No idea how well it works with 134a. If you're going with an R12 'alternative' such as Freeze12 or Envirosafe. It would be better to convert to R134a.